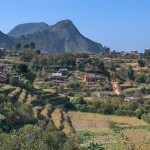 Damauli, today Byas Municipality, is the headquarters of Tanahu District in the Gandaki Zone of Western Nepal. At the time of the 1991 Nepal census it had a population of 18,099 people residing in 3604 individual households.It’s one of the well planned towns in Nepal.The beautiful town Damauli is growing fast to be one of the major cities in the country. Majority of the population are engaged in some kind of business. Damauli is easily recognizable because it is located on the confluence of two major rivers the Madi and the Seti. A lot of tourists come Damauli for rafting in the Madi river The Manung hill is another important geographical landmark overlooking the Town Damauli.